Tripwire Interactive may be a small studio, but they more than make up for that with their continued support of their games well after launch. Case in point: Killing Floor. 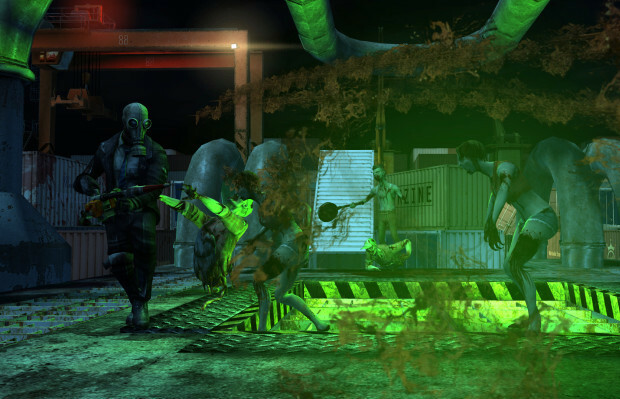 The co-op zombie shooter came out way back when zombie games weren’t done to undeath in 2009 and still the game is receiving updates. The newest one is called The Hillbilly Horror Fright Yard. This update brings a bunch of new content to the game, chief among them a new map. The map is called Fright Yard and is set on an abandoned shipping yard. The map will support both the Objective and Wave modes and features a whole bunch of interactive elements to make playing it that much more interesting. Of course, it wouldn’t be a holiday update for Killing Floor if there wasn’t any reskins of the classic enemies and this one certainly brings those in the form of the fan favorite hillbilly zombies. To help you fight the redneck menace, Tripwire has saw fit to give us a few new toys to help mow down the Cletuses of the world. First up is the new Us vs. Them Weapon pack, which adds 4 new weapons to the game. 2 of them are makeshift weapons while the other two are prototype weapons from Horzine. In addition to that, a new skin pack has been added, as well as a new playable character in the form of Reggie the Rocker. He may or may not look like a certain Rolling Stones frontman and given the fact that he drinks gasoline like it’s nothing, I think it’s safe to say that he’ll do just fine in the Fright Yard. The update is out now and the event lasts from now until November 7th. To help commemorate the event, the game and most of its DLC is on sale for the duration of the event. At five bucks, you really have no reason to pass up the mountains of content in the game.